Can one call oneself Tamil if one doesn’t know this song? This gem amongst the gems written by the great poet Subramanya Bharathi has such an extraordinary appeal! For one, we all love stories about the mischievous and quite irresistible Lord Krishna, don’t we? And then there is the poet’s expertise in choosing words and metres which resonate so deeply with the audience. However poetry by its very nature finds itself at a disadvantage crossing borders; for isn’t poetry about language at its very best, its very beautiful? Who but natives can really appreciate it? But once it has been sung as a song, it crosses borders so much more easily! Popular as a ‘light’ piece in Carnatic Music, this song happily bridges the gap between the classical and the popular. I hope you will join me on a walk-through of this beautiful poem and its meaning. I limit myself only to the verses sung by Carnatic musicians. Krishna (kaNNan) is such an endlessly (tIrAda) playful (viLaiyATTu) boy (piLLai)!! He is a ceaseless (OyAda) trouble (tollai) to the women (peNgaLukku) on the street (teruvilE)! The first verse sets the scene perfectly. Such an endlessly mischievous lad, the poet says, that he is Trouble with a capital T to all the women on the street. Why women? Did He not direct any mischief towards the men? But no, He never did! He was the darling of the women and he loved them dearly; yet it is those very women He troubled! Our symbolism starts here..He is Parama Purusha, the supreme male aspect. All creation, Prakriti, is the female aspect. We see this symbolism again and again in poetry from all around India. He will bring (konDu) and give (taruvAn) fruit (pazham) to eat (tinna). While (pOdilE) eating (pAdi =half, tinginDRa) he will grab it (taTTi paRippAn)! If (enDRAl) one cajoles him (ennappan, ennaiyyan as terms of endearment) – he will bite it (kaDittu) and contaminate it by eating (echchiR=jhUTA in hindi) and then give it back (koDuppAn). What mischief! He grabs back the fruit he has given and takes a bite before giving it back! I wonder, is this concept of contamination by eating/saliva unique to India? In the olden days, at the wedding feast, a wife would eat off the plate eaten by her husband to denote the closeness of the new relationship. Sharing of food half eaten by others is a privilege limited to those who are near and dear. Here the poet wants to show how close the relationship is between the Lord and his subjects. Krishna is happy to eat the fruit half-eaten by his loved ones (remember Rama and Sabari?) and what He gives back we take as prasaadam. So what does the fruit denote? All that He gives us, of course! Perhaps the poet wants to say also that He who gives may equally take away. He will bring (konDu vandE) a beautiful (azhaguLLa) flower (malar). After (pin) making one cry (azha azha seyda) He will say (enbAn) ‘close (mUDikkoL) your eyes (kaNNai), I will adorn (sUTTuvEn) your braid (kuzhalilE) with it’. After making (Akki) me (ennai) blind (kuruDu), he will place (vaippAn) the flower (malarinai) on my friend (tOzhikku)! Have you ever seen something you wanted very badly? Perhaps you begged and pleaded for it, perhaps you worked hard for it, but you thought you almost had it. And then when you relax for a moment, it is gone, given to some other. In real life this could be tragic. Imagine it is the promotion you worked hard for, the treat your parents promised you, the relaxed retirement you look for after a lifetime of work. And then circumstances occur when it seems to be snatched away from you. How frustrating it is, how depressing when it happens! If we can see it as no more than Krishna’s mischief, his leela, perhaps it will console us. He will pull (izhuppAn) one’s braid (pinnalai) while standing behind (pin ninDru). Before (munnE) one can turn (tirumbum) one’s head (talai) back (pinnE) He will disappear (chenDRu maRaivAn)! He will make one sorrowful (varutti) and agitated (kulaippan) by throwing (vAri) dust (puzhudi) on (tanilE) one’s new (pudu) colourful (vaNNa) sari (sElai). Krishna pulling at a Gopi’s hair and disappearing – isn’t it a disarming portrayal of our mischief making Lord? Has your metaphorical braid been pulled by someone or something at any time? How frustrating not to be able to pinpoint who did it! And what about your metaphorical new clothes? Has someone thrown dust as it? These are common life occurrences, aren’t they! They sadden us, agitate us, disturb us. And yet we smile when we think of Krishna and his mischief. That too is a leela. He will bring (konDu varuvAn) a flute (pullAnguzhal). He will recite (paDippAn) good (nal) songs (gItam) which overflow (pongi tadumba) with nectar (amudu). And like (pOlE) one gets intoxicated (mayanguvadu) with liquor (kaLLAl), we would be listening (kETTiruppOm) with closed (mUDi) eyes (kaN) and open (tirandE) mouths (vAy)! This is a lovely verse where Krishna is portrayed as the enchanter that He is. And oh, how I love Raga Mand! In the other verses the poet talks of how He troubles and agitates the women. In contrast, this verse is about how he fascinates with his playing of a different kind. What is Krishna’s song in your lives? What is that which enchants you, intoxicates you, absorbs you? 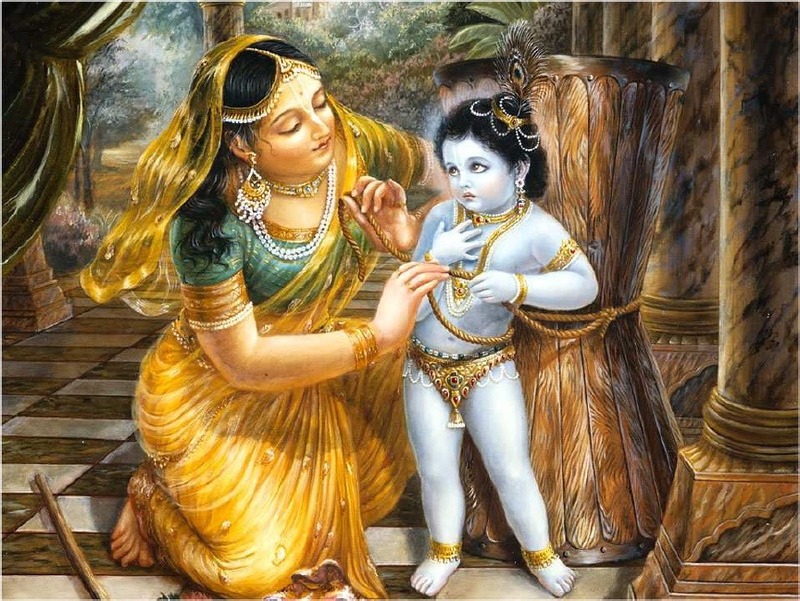 As to me, I hear Krishna’s song in so many things – in the light which reflects off the lake I see from my window, in that pause between two notes when Lalgudi plays Mohanam in a CD I have, in the perfection of Vermeer’s Milkmaid, in that smell of the earth just after it rains, in the memory of cuddling my children when they were babies and a million other things besides. These are indeed nectarine as the poet says. After listing all the mischief the Lord plays on us, it is good of the poet to remind us of how He plays his music for us too! To present this song, I have chosen renditions by two divas of the Carnatic Music world, Bombay Jayashri and Nithyasree Mahadevan. I have always loved Bombay Jayashri’s voice and in this recording it sounds warm and lovely, as smooth as honey. It is Nithyasree Mahadevan’s crisp enunciation which attracts me to this performance. This is poetry as it should sound!